You are not logged in. [Log In] Pond Boss » Forums » GENERAL QUESTIONS » Property Projects & Construction » Rain Dance! Amazing. We’ve received 2.6” since 10/1. I was pretty happy with that. I know the folks around Chillicothe were pretty dry earlier this summer, but I think everyone is getting caught up. Hopefully Bob is getting some of this. We had a total of 8.5" since last Friday. It was drizzling this morning too. Not much for me. I got about .10" last night, which makes my total for the month, about.35" so far. No where near as much as I thought I'd get, the way they was talking on the news. We received exactly 1.0" since yesterday afternoon. It stopped drizzling by about 9:30 this morning. Zero run off from this rain. Before this rain, the ponds had equalled their all time lows since first fill. They are about an inch above that now. The last rain that had "run off" was July 18. BTW, the forecast always has a "wet bias". "According to Silver, The Weather Channel has openly admitted to deliberately exaggerating the probability of precipitation when it is low. This is because of biased incentives: if the correct low probability of precipitation is given, viewers may interpret the forecast as if there were no probability of rain, and then be upset if it does rain. In other words, The Weather Channel compensates for the people that have greater loss aversion than they think they do, and therefore miscalculate their cost-loss ratio when it is low, by deliberately inflating probabilities. Silver quotes Dr. Rose of The Weather Channel as saying, "If the forecast was objective, if it has zero bias in precipitation, we are in trouble." My place in Wichita received about 6" in the past 5 days! Every river within 60 miles has a flood warning on it. Ponds and Lakes are full now! I guess a big rain will eventually come here, but who knows when? Been in Jeff City MO all day and got home and measured pond this evening. It’s up 2” more. Water is still coming up in from several areas. Calling for cold rain Friday and Sunday night. Pond is probably 11-13” from full now. Amazing how low it really was. Going to take boat out and do some depth measurements this weekend. The ground still feels like a sponge in several areas around the pond and we are still rising (about 2" per day) however it is slowing down a lot. One reason being is that it's filling up a much larger surface now. We are supposed to pick up a .25" of rain today and possibly a .5" Sunday. However the ground is still so wet I'm sure most of it will run off. Going to try and fish some tomorrow. Sounds great Ryan! I will be curious how the fishing goes. Massive water level change, temperature drop, and high/low pressure effects...the fish are probably a bit anxious. Let us know what you pull out and how you did it. We received 0.16" overnight and early morning. Typical for here for the past few months. Picked up a surprising 4/10” today. Now we are around 11-12” from the overflow pipes. They are calling for some rain/snow mix Sunday then sunny next week. Not sure we will make it up to the overflows. Didn’t fish the pond this morning but went to local lake where a buddy lives. Caught a 4.7’ LMB and had another throw the hook at the boat that was a big boy definitely bigger than the other. BG were biting hard too. Two day total rain here 0.22". Possibly more rain this evening and tomorrow. I ended up getting .25" yesterday. Not much, but better than nothing. I hope to get a little more tomorrow. Three day total is up to 0.86" now. Very very little help to the ponds. It's typical of this year. 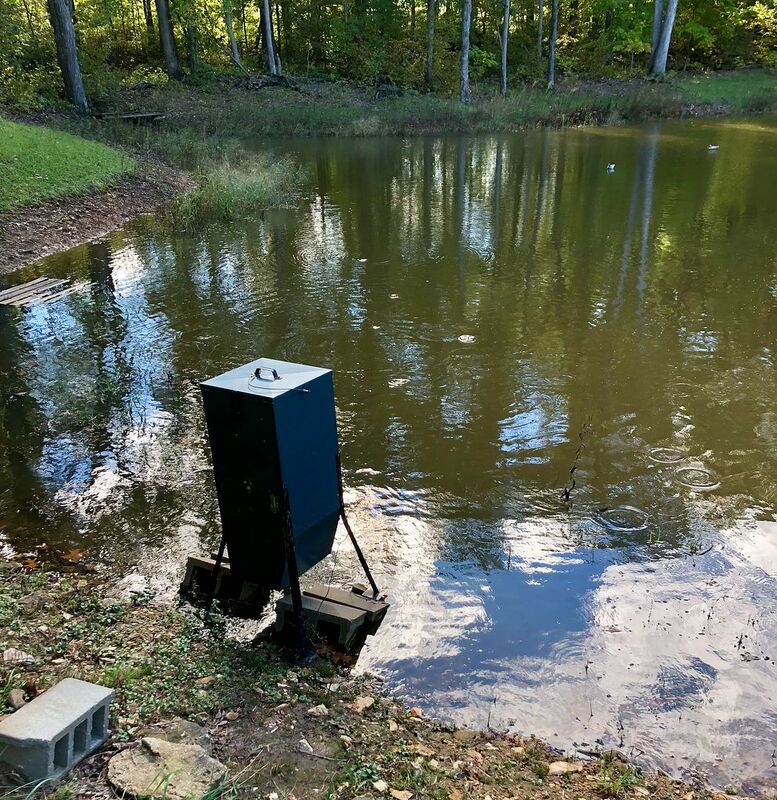 Small, frequent, slow rains that do nothing for ponds. They are calling for .1-.5” today then sunny rest of the week. The pond has come up almost 4” since Friday morning, right now it is just ground “springs” filling it up. The neighbors call them springs because they leech a lot of water during wet periods but they were absolutely dry during this drought. There are probably 2 dozen of those spots up hill from the pond and one large below our pond before the neifghbors pond. I don’t think that is a spring, we have zero rock in our soil, when excavated the house not one rock was found. We had 5-6’ of top soil then pure clay below that. My belief is water saturates through the top soil then finds ways to poke out once it hits the clay layer. Fished this morning and the BG were hitting the pellet food really hard, but not too much on live worms, only caught a half dozen of them and one bass. The Hybrid BG sure are getting big, they all all 2” or more wide. All the fish I stocked this spring look very healthy and I see a wide range of size of BG when I feed them. The BG seemed to have moved into the gravel areas I put in during the drought. They liked that area before I just lined the whole bottom with free playground gravel. I got about .20" last night, not much but I'll take it. Unfortunately there doesn't seem to be much more in the forecast right now either. We got 0.37" last night. Measured pipes this afternoon, pond came up another 2” only 4 more to go! After being 2 feet low since July, my BOW is finally rising. Hope that we get the overflow pipe running soon, as that means full pool. Also, rain will fill my forage pond so I can stock it. Need to check again re possible turnover what with rain & big chill. TP likely won't make it, but that is to be expected this time of year.